Trump/Russia is a complicated story, made more complicated in the initial months by inadequate coverage in the mainstream media. Journalism tends to be siloized, so links between key reports often went un-linked in the press. My role during this Age of Trump was to take these disparate news stories and stray tweets and giving them shape and structure. Using my novelist’s skills. I sought to develop a narrative of Trump/Russia, one that could easily be followed. A gander at my archive for the last year shows that I have been successful in my endeavor. I have not actively sought out donations or set up one of those accounts that work like a virtual tip jar, because I did not want anyone to suggest that there was some financial gain in this for me (there is not; to the contrary). However, as shrinking ad revenues threaten to shutter The Weeklings, I have decided to set up a special fundraiser, #ResistDirtyRubles, to keep the lights on there. These 100% genuine, authentic 3-ruble banknotes circulated in Romanov Russia and the Khruschchev-era USSR. 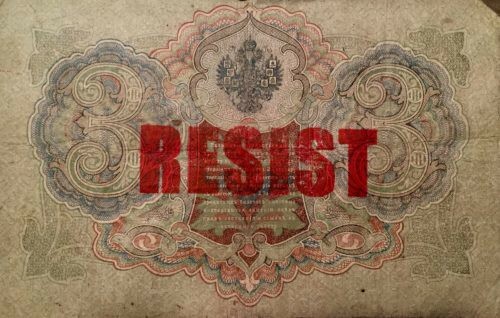 We have stamped them RESIST, to remind certain American politicians what they’re supposed to do with dirty rubles. This genuine 3 ruble banknote was issued by Nicholas II, the last tsar of the House of Romanov, and features the family’s distinctive double-headed eagle. It circulated in Russia from 1905 until the Bolshevik revolution in 1917. 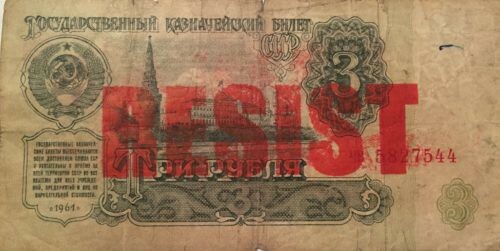 This genuine 3 ruble banknote was issued by the Soviet Union in 1961, during the reign of Nikita Khrushchev, at the height of the Cold War. It features a picture of the Kremlin and the famed hammer and sickle insignia. We are selling them for $10 for the Soviet issue and $20 for the Romanov issue. Proceeds help support The Weeklings and my future Trump/Russia coverage. If you’ve appreciated my work in the last year, I ask that you please show your support by buying some dirty rubles. Send them to your favorite Kremliny politicians, like Paul Ryan and Devin Nunes. Mail them to NRA headquarters. Use them as a bookmark when you re-read Collusion. Burn them in protest, even. But please do consider purchasing your own dirty rubles. Every little kopek helps.